Blood Crown Open Beta Announcement! GTArcade is excited to announce we're all set to release the Open Beta of our highly anticipated SLG title,Blood Crown,on September 19th! The bloody moon shines through the depressing haze of dusk. Battle steeds gallop ahead and wolves howl throughout the night. Vampires, Humans, Werewolves... Who will become the conquerors of the world? 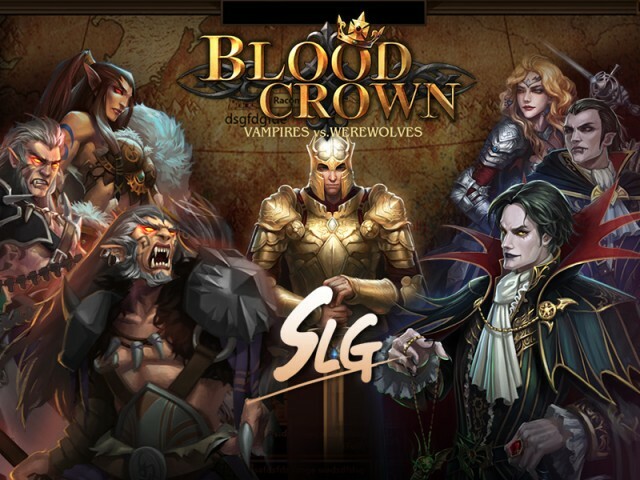 Come play a new Free Game—Blood Crown, to forge your own path and bathe in glory! In the middle of the 14th century, Europe lies devastated from the effects of the “Black Death”. Over 50% of Europe’s population has vanished almost overnight. Meanwhile, the Vampires and Werewolves see this as an opportunity to rise from the shadows. Now both factions are looking to dominate all of Europe, waging war over territories and conquering the shrinking Human population, each hoping to enslave them. Amidst the chaos, famine and despair, Humans prepare to fight for their survival and to persevere through the dark ages. The time has come to choose your faction! GTArcade is excited to announce that everything is all set for the release of their highly anticipated SLG title, Blood Crown. The release will take place in the middle of September! Blood Crown will feature all the great aspects that fans of SLG's love, such as plenty of magnificent buildings, beautifully drawn complex maps, a tactical battle system, tons of skills, technology, heroes and a terrific guild battle system! "We're confident that Blood Crown will be a success," says Frances Sun, Product Manager for Blood Crown. "Players have time to play and discover items not only by themselves but also with help from their guild. If players want to be the king of the world, social interaction is an important tactical point for players to consider." This extra emphasis on social gameplay creates a different experience every time players log into Blood Crown. Many different magnificent 3D buildings can be built inside players’ own territorie. Building become more useful as players can to gain resources and quickly develop new technologies! Use countless combinations of skills to train heroes! Each hero’s various skills can be changed by players if they want to adjust the efficiency of their party. Selecting the combination of skills which best suit a players’ hero will be a rewarding way to interact with the game. In every fight against others players, tactics will be adjustable at will according to your enemies weaknesses! Examples include adjusting the decision of what warriors to use, calculating the time and distance of travel before attacking and much more! During battles, players will also be able to chat with their allies to discuss battle plans and strategies! Want to build buildings and upgrade technology more quickly? Want to make more friends? Want to beat the strongest enemies? Want to improve the social interaction? Join a Guild as soon as possible! It will let players reach their ultimate power more quickly! GTArcade is a leading developer of online games. With its guiding principle “sharing simple joy”, GTArcade has developed award winning products for browser and mobile platforms around the world, and is now focusing on English language markets with its latest browser games, League of Angels and Knight’s Fable. Go to www.GTArcade.com today and start playing!